There’s something in the light, in the way it reflects on the water and casts shadows in the sand, but Middle Beach at Studland holds the same fascination for artist Ian Hargreaves as Monet’s garden at Giverny, or the Grand Canal in Venice, or twilight on the Bosphorus at Istanbul. Whatever he’s painting Ian works from the reference photos he takes, sometimes choosing single scenes from multiple variations of the same vista, at other times just a single snap. The photos constitute a kind of sketchbook – shorthand notes of things that might make it into the paintings – so a couple of figures from one could end up in a scene from another, depending on the compositional needs of the painting. 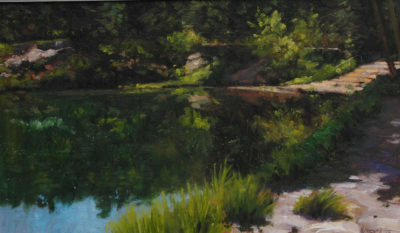 He works in acrylic and oil and embraces the change in mood and tempo that a range of subjects presents him. ‘I’ve always got a camera with me and I have an eye for recognising a scene, but I’m certainly no photographer. I look to the left and right of me and straight ahead, but I also remember to look behind to see where I’ve just been and it’s surprising how often things appear differently when you look back at them. ‘Despite what I said about Old Harry Rocks, I couldn’t paint the same view in the same way over and over again, that would destroy me. I switch between landscapes and townscapes, between painting with the brush and doing something very architectural to picking up the palette knife and freeing up. Ian grew up in Bournemouth and as a teenager studied Technical Graphics at the old art college near the Lansdowne. Soon after graduating he landed a well-paid job with IBM but it only lasted 18 months or so before, inspired by a work colleague, he filled a backpack and set off with an InterRail pass to explore Europe. Ever since then, in one form or another, art has provided Ian with daily bread and a roof over his head – from drawing thousands of portraits on the streets of London and Palermo, to teaching painting to housewives in northern Germany, or creating canvasses large and small that sell in galleries throughout Europe. A decade ago Ian moved back to Dorset after 24 years in Germany. 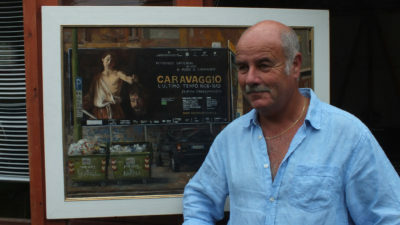 He prepared for the move by contacting galleries and putting his work in circulation, creating a base level of interest that he has been able to build on and he has since sold work from the Royal Academy, twice been accepted into the prestigious Lynn Painter-Stainers Prize Exhibition and in 2016 was named Artist of the Year by Artists & Illustrators magazine. Judging by the work stacked up in Ian’s studio those days are rare and currently his most pressing problem is finding time to make the paintings he has planned from his five trips abroad this year – ‘That’s unusual, we usually only manage a couple’ – and getting his teeth into some of the local scenes that are calling him.